Select Mail from myapps, if not already displayed. Your mail displays consisting of a number of toolbars and panes. 4. Message list: displays contents of the selected folder. 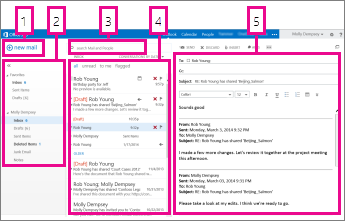 5. reading pane: displays the body of the selected email message. You can sort messages by a variety of filters, including Date, Size, From, or Subject. In the top of the Message Pane, click the Arrange by or Conversations by bar. A list of sorting options will display. Conversation View displays messages grouped by conversation topic. The Reading Pane displays the active message in the conversation, and the most recent email displays at the top of the group. The Inbox is split into 3 sections by default, with folders displayed in the leftmost Navigation Pane, messages displayed in the middle Messages Pane and the Reading Pane displaying message content. Your college email has system folders such as Inbox, Drafts, and Sent Items. You can create your own folders to organize your email. Click on the Reply button in the toolbar or click on Reply in the message window. Click on the Forward button in the toolbar or click on Forward in the message window. To delete an open message, click the Delete button on the toolbar. To delete a message in the message listing, right click the message and choose Delete, or select the message(s) and choose Delete. Deleted messages are moved to the Deleted Items folder. Items in the Deleted items folder will generally be kept for 14 days before being automatically permanently deleted. Contact information for our students, staff and faculty. The title beneath their name will tell you if they are a student or faculty/staff. Click on To: in a new mail message window. Click on the Plus + sign in a new mail message window. Select People/Contacts from theOffice 365 app launcher. Contacts allows you to create a distribution list so that when you are addressing an email and select a contact list name, the email will automatically be sent to all members of the list. From People/Contacts, Click Add (+), then select Create Contact List, Name the list and add members. There are 2 ways to send your student email to another account, if you choose to do so: Forwarding or Creating an Inbox Rule. To stop the email from going to the other account, you would need to turn off the forwarding or the rule. Automatically forward all e-mail sent to your 365 student webmail account to another account. Login to your student email and click the Settings icon (Gear - upper right). Under Your app settings, click on Mail. Under Accounts - Forwarding, enter the e-mail address of the account you want all e-mail to be forwarded to. Select Keep a copy of forwarded messages to keep a copy of your forwarded messages in your student email account. Click Save to save your changes and start forwarding all incoming messages to another account. Focused Inbox is now turned off by default for college email. You can turn on the Focused Inbox feature in email if you want to. Or you can also choose to select individual emails in your Other Inbox, right-click and select Always move to Focused Inbox. What is Clutter and How do I use it or Turn it Off? Clutter has now been replaced by Focused Inbox. Uncheck the box for "Separate items identified as Clutter"
No further messages should be sent to this folder. If you want to use Clutter, be sure to keep an eye on your Clutter folder to make sure you're not missing anything important. To mark messages as "not clutter", either right-click on the message and choose 'Mark as not clutter' or drag the message it to the Inbox. If messages you want marked as Clutter are not automatically sent to the Clutter folder, you can right-click the message and choose 'Mark as clutter' or drag it to the Clutter folder.